Social Media Marketing has changed dramatically the way we shop, the foods we eat, the music we listen to, the clothes we wear and whom we do business with. These days your sales depend less on your floor salesman and more on your online presence and your business and product reputation online. We no longer reach for Golden Pages when we need some product or service. We search for a company website on Google, read product reviews on Blogs and ask for recommendations on Forums. We don’t just tell our best friend or a colleague about our bad shopping experience, we broadcast it to the world on Facebook or Twitter. So what is Social Media Marketing (SMM)? Social Media Marketing involves sharing content and building relationships with your potential and existing clients via various social media channels. It may seem easy, but there’s more to it than simply sharing links over Facebook and Twitter. Making your website or business stand out in the social media requires carefully thought out planning and using the right tools. Location Based Social Networking sites e.g. Foursquare and Gowalla. 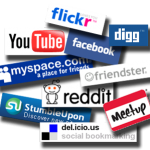 Social Bookmarking sites e.g.Del.ici.ous, Diigo, StumbleUpon . As of the end of February 2011, there were an estimated total of 642.5 million Facebook users worldwide. There are 1,858,180 Facebook users in Ireland (nearly 50% of population), 152,189,880 in the US ( 71.2 % of population) and 28,940,400 in the UK. Is Social Media Marketing a Fad? Social Media Marketing is time consuming and a bit overwhelming for most businesses. Many small business owners shy away from social media thinking it is a passing phase, in other words, a fad. How Social Media Marketing can benefit your business? Gary Vaynerchuck, a video blogger and co-owner of a wine retail store, grew his family business from $4 million to $50 million using social media. He found that $15 000 spent on Direct Mail brought him only 200 new customers, $7500 spent on billboards – 300 new customers, and $0 spent on Twitter -1800 new customers. Dell sold $3 000 000 worth of computers via Twitter. According to the research conducted by a web hosting provider Moonfruit, a $15K investment in social media brings 300% increase in traffic and 20% increase in sales. Social Media is fast becoming one of the most important sources of web traffic. Getahead Online can help your business generate leads, build your brand and connect with customers using Social Media Marketing. Ongoing Social Media Marketing that involves content sharing, relationship building, increasing fan base etc.